Bathtub transfer benches provides support and safety when entering and exiting a bathtub as well as a nice sitting area. The bathroom can be a hazardous place for those who have a balance problem or who find it difficult to get around the house. The fixtures that younger people take for granted, such as slippery bathtubs or low toilet seats cause many accidents for the elderly or others with physical limitations. Not all homes have accessible showers or even sturdy hand grips (grab bars) in the bathroom. There is a solution, however, in the form of bathtub transfer benches that make it easy for anyone to get into and out of a bathtub. Benches and shower chairs for bathing and showering come in many styles, from a simple chair to place in the shower, to a bench with a back that straddles one side of the bathtub. Wide transfer benches are made with a padded vinyl seat on sturdy aluminum non-slip legs that fit over one wall of the bathtub, so that two legs are inside the tub and two outside. The person wanting to bathe sits on the bench and can easily swing one leg into the tub and then the other leg, while staying completely balanced and safe from falling. Many individuals and caregivers feel a bench with a back is the safest of all, as the person can lean back against the support and feel even more secure. 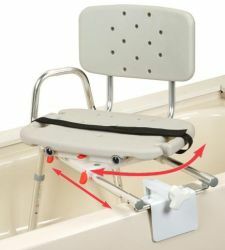 Someone who is unable to spare the space for wide transfer benches in their bathroom can instead opt for bathtub mounted transfer benches with a swivel seat. They offer the same assistance, safety and support but without the extra legs sitting outside a bathtub. The price range for transfer benches run from an inexpensive $50 all the way to $499 or more for a custom bench. Benches at the low-end are simple and sturdy enough to support at least 300 lbs. Those on the high end of the scale such as bariatric transfer benches can support up to 850 lbs., and will naturally cost more due to their durability and higher weight support. Sliding Transfer Benches – Slide across one end to the other and completely bypass the bathtub curb or lip. 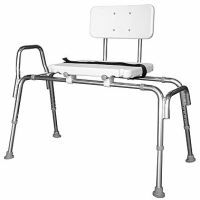 Bathtub Transfer Benches with Swivel Seat – Mount this transfer bench on your bathtub and have the comforts of a bathtub transfer swivel seat without all the extra room being taken up by bench legs. Bathtub Transfer Benches with Back – This transfer bench has wide seats for larger people and is quite affordable. Most people want to remain independent as long as possible, and bathroom assist products help them to do just that. Some people find it embarrassing to ask for help with bathing, and if he or she can use a transfer bench safely, that independence can be extended indefinitely, making a great improvement in the person’s life. When it finally becomes necessary to have a caregiver, the transfer bench will still be one of the best safety tools in the bathroom.